In this important study of the abortion controversy in the United States, Kristin Luker examines the issues, people, and beliefs on both sides of the abortion conflict. She draws data from twenty years of public documents and newspaper accounts, as well as over two hundred interviews with both pro-life and pro-choice activists. 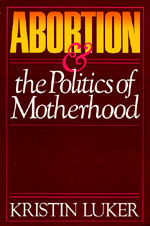 She argues that moral positions on abortion are intimately tied to views on sexual behavior, the care of children, family life, technology, and the importance of the individual. Kristin Luker is Professor of Law and Sociology at the University of California Berkeley School of Law (Boalt Hall). She is also the author of Dubious Conceptions: The Politics of Teenage Pregnancy (1996) and, with Jean Fox O'Barr, Feminism in Action: Building Institutions and Community through Women's Studies (1994).